Oh! I do like to be beside the seaside, I do like to be beside the sea. Specifically, I do like to be beside the seaside in Cannes (for MIPIM, the world’s largest property event), and this year was no exception. It is amazing how much can be achieved by taking us all away from our silos and bringing everyone together into one place, with a common interest of connecting and making things happen. It’s truly inspirational. Those of you who know me know how much I believe in partnership working and collaboration. We are better when we come together, as a united community from across different backgrounds and inter-related professions connecting and collaborating to address a challenge and make a difference. This week I have been inspired by the London at MIPIM community, a group of individuals who came together to promote their respective places and brands but to work as one to promote London to the World. As always, it makes me proud to be part of the broader London community and specifically at MIPIM to be part of the West London Business (WLB) community. It’s such a powerful network of inspiring people and places working together for the greater good. This is demonstrated all the time through the way they work collaboratively across North West London with local authorities as well as different sizes of and sectors of business and other stakeholders. This year at MIPIM I was an associate partner of WLB and once again supported their presence with place marketing and stakeholder engagement. 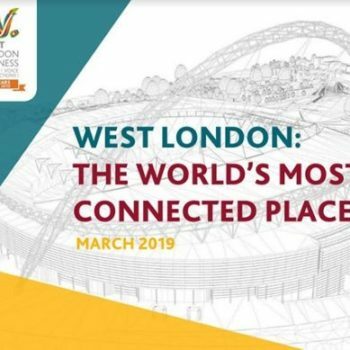 They launched at MIPIM their research showcasing why London, and specifically West London, is “the world’s most connected place”. A report well worth a read as it showcases not only transport connectivity but a range of other benchmarks including the diversity of the population base in West London and therefore the connections to the rest of the World. We were delighted to hear during the week from Liz Peace, CBE, Chair of Old Oak and Park Royal Development Corporation (OPDC) who announced on the Wednesday that they have been successful in their bid for £250m of Housing Infrastructure Funding for the Old Oak North part of the site, close to the new transport ‘Super-hub’ where the HS2 and the Elizabeth Line will meet. This funding will kick start delivery on-site and act as an enabler for infrastructure and future housing delivery. Ultimately the area is set to deliver 25,500 new homes and 65,000 new jobs. Working with Deetu this year we launched a new West London Business #placetech tool. The West London Explore model is a fantastic base line resource that we are working hard to build on over the coming months and years. It showcases opportunities across our current West London MIPIM partners and across West London as a whole, from transport connectivity to sites of interest. Watch this space to find out what else we do over the long-term and if you are interested in taking part please do contact me to find out more. We worked with another fantastic group of partners this year. Thanks are due to all of these for their enthusiasm and energy. From Monday to Friday together we hosted a welcome dinner and a survivor’s breakfast and 5 on stand events in between. We collectively showcased West London as a community of interested partners, from the largest regeneration site in the UK (Old Oak and Park Royal Development Corporation (OPDC), to partners delivering new homes for Londoners (Fairview New Homes and L&Q, and Interland Group) to those providing much needed industrial space for our business community (SEGRO), to builders and developers of schools, hospitals and homes (Kier), to architects and designers (Child Graddon Lewis), innovative smart glass solutions for interior and exterior architecture (G-Smatt Europe) and our place tech partner (Deetu). We should be proud of our collective achievement and to me this demonstrates the industry at its best, the power and importance of working together and of fostering a community in the industry. We get more done when we harness our collective experience, perspectives, expertise and strengths. Let’s collaborate and connect and make a difference – together.